Gibson is both a playwright and poet. He was born in New York, NY and he attended what is now City College of the University of New York. 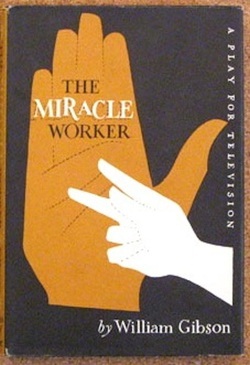 The Miracle Worker was originally written as a television play. Even though he has written over 25 plays, The Miracle Worker continues to be his most famous. It was later adapted for the stage, screen and again for television in 1979. How is discipline important in learning? • In what ways can people communicate? • How does the past affect our present and future? • How does the use of flashback heighten conflict? • What elements of prejudice are present in this piece? • How are characters revealed through dialogue? • How do relationships change? • How are symbols used by good writers? • What is the value of determination? How can education be painful? How does perception influence what is seen? What is the relationship between words and their meaning? Connotation vs. Denotation. Can meaning limit what is seen? How do human beings approach what they have never seen? How is Annie's love different from the Kellers'? Anne and the Keller’s both want the best for Helen. What makes Anne able to succeed with Helen when her parents were not able to have any success?